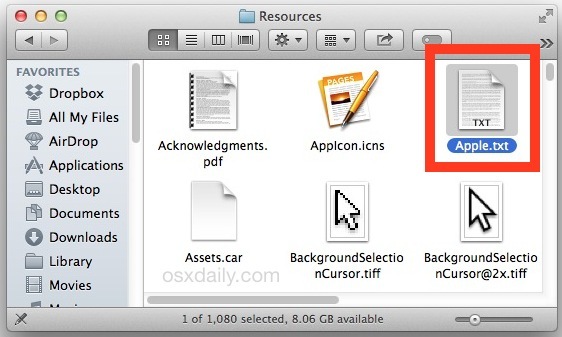 Every Mac which has the Pages app for OS X installed includes a little Easter Egg that few know about; a famous Steve Jobs speech, tucked away in a little unassuming folder. Technically, it’s two different Steve Jobs speeches, the famous text from the Crazy Ones Think Different campaign, and arguably the even more famous 2005 Steve Jobs commencement speech from Stanford University. Note that you must have Pages.app installed in OS X to find the Easter Egg file, Pages is free as part of the iWork suite nowadays on new Macs, and older versions can upgrade to the latest versions for free. The file exists in the newest version of Pages and presumably older versions as well. There may be a way to access the speech somewhere from the Pages app without launching it directly or accessing it through the apps Resources folder, if you know of one let us know in the comments. The Crazy Ones text also appears written on the icon for the TextEdit application. All that, in this little Apple.txt text file, is that great or what? It’s not known if this is a tribute to Steve Jobs, or simply a hidden appreciation for the fantastic speech, or if it serves another purpose entirely. A big thanks to Alex for sending this in. If you know of any other Easter Eggs on the Mac, be sure to let us know! Great find, and great speeches. Steve Jobs is truly missed. A funny networking Easter Egg is the Windows network machine is a BSOD (Crashed) Windows PC with the Blue Screen of Death. Have to connect to a PC share to see that. And once upon a time you used to be able to hold down the Option key and go to “About the Finder” and get a cool picture of roster of those who worked on Mac OS, but that is gone. Most Easter Eggs on the Mac now are just part of icons though, I’d love to hear some more! A shared Windows computer shows up as an old beige monitor with a Blue Screen in OS X, not sure if that’s an Easter Egg or just a joke. It’s not in Pages ’09 4.3. I’m guessing that the file was added as a memorial. Jobs’s commencement speech, like David Foster Wallace’s, is very useful reading for young adults, or for anyone. Apple.txt not found in iWorks ’09/Pages.app. If you look at the Keynote icon in OS X, it names the streets nearest to Apple, Inc. Put that in the terminal to open it in text edit. The last part of the phrase is not written on the text. Does not exist in my OS X 10.6.8. Not on my 2007 iMac with Pages ’08. If you go to this file, you can see an extended version of the Crazy Ones ad text. Two paragraphs that never aired in the commercial can be found in the .txt file icon. Steve was great. He is missed. I already installed the newest Pages.app v5.5.1 but there is still no apple.txt. Please help. Probably limited to the USA? 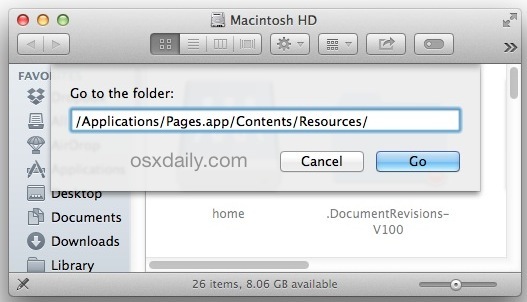 The file /Applications/Pages.app/Contents/Resources/Apple.txt does not exist. The “Here is to the crazy ones” text is often falsely attributed to Steve Jobs. He was not the author, it was a copywriter who worked for Chiat Day, Apple’s advertising agency. People involved in the project later said Steve Jobs actually hated this text from the start, and it he slowly accepted it after numerous changes and adjustments. He was also reluctant to use it and narrate it himself, because he did not want to put the focus on himself, but on the Apple brand. Update in early 2018, I can’t find it. I looked through as many files I could, I found the other files like the acknoledgements and the pages icon, but the speech doesn’t seem to exist. This was something small that was really cool and a beautiful tribute to Steve Jobs. I’m not sure if they removed it in Mac OS High Sierra or moved it to an impossible spot, but I find it sad that it’s gone.